Word-of-mouth may well be the oldest marketing strategy around, but its power has reached new heights in this online age. Today, your most important business asset is your reputation. That’s where getting on Google’s good side comes in. Customers look to the search engine to learn about everything from winter coats to restaurants to the best plumber in town. The badge — Google’s seal of approval — appeared as a small check-marked icon shown on the lower right of retailer websites. The basis of the badge was to give customers more confidence when shopping by providing certain stores a direct endorsement from Google. To qualify for Trusted Store status, online retailers were required to apply and provide a range of data to Google. Initially, that data included sensitive information on shipping and cancellation feeds, which Google later did away with. Another big change came with its integration with Google AdWords. As of 2013, Google Trusted Stores became one of the services that helped supply seller ratings, which show on AdWords ads and Product Listing Ads. There were quite a few benefits in earning the badge, and not only for pay per click marketing. First of all, it’s a free certification designed to boost businesses credibility. In theory, the endorsement from Google should lead to a boost in sales. Because of the high competition in today’s market, the badge served as a way to let customers know that your store was trustworthy and give you a leg up on the competition. To show how seriously Google took its approval system, the site essentially insured its Trusted Stores sales up to $1,000. That meant If customers made a purchase of less than $1,000 and the product didn’t arrive, they could go straight to Google. If your store didn’t take care of it, Google would. Naturally, stores stood to lose their status as a Trusted Store if that happened. But it still showed a high level of approval from Google. And if Google approved, why wouldn’t customers too? Why Did Google Trusted Stores Shut Down? While that all sounds well and good, in April Google retired Trusted Stores in favor of its new Customer Reviews process. Due to the characteristics of the new program, we can guess that the new system has to do with an increasing reliance on shopper’s feedback. With the Trusted Stores model, businesses who could prove that they follow Google’s standards received a digital badge to display on their site. That badge was an easy way to let customers know that they could trust an online store. But, the old program didn’t offer much information to customers. Brands could either sign up or not, and that was that. Google Trusted Stores went through a few updates before rebranding as Google Customer Reviews in 2017. The updated review platform is a free business tool that allows Google to collect reviews about a brand and/or the products they sell. The main benefit of collecting feedback through the search engine (as opposed to Yelp or Facebook) is that reviews are verified and factor into SEO standing and visibility. It’s important to note that with the change, the consumer protection aspect (insurance on up to $1,000 worth of goods) of Trusted Store no longer exists, nor does the Trusted Store badge. Like Trusted Stores, Google’s new Customer Reviews signals a positive buying experience for potential customers. Unlike Trusted Stores, it relies on customers to do it. Google Customer Reviews is a free service that allows online retailers to collect feedback from those who have made a purchase on their site. To enable the reviews, sellers must have a Google Merchant account. Google also notes that the feedback will be applied to merchant’s seller rating, which appears on search ads and in Google Shopping. The program is powered by surveys collected on the purchase confirmation page. Where the original Trusted Store status was all about customer protection, Google Customer Reviews gives customers the final say over whether a business is trustworthy. For brands, the benefit is that they can collect reviews for free. Google makes sure that reviews don’t come from bots, which provides your site with accurate customer data. For customers, positive reviews function as a positive first impression and show social proof. With that in mind, brands must give customers a positive experience to achieve today’s version of becoming a Trusted Store. After customers have made a purchase on your site, they will be presented with an option to opt-in to a receive an email from Google requesting feedback on their experience with your site. Google notes that the survey cannot be placed directly on the confirmation page; rather it’s only available by email after a product has been received to ensure the most accurate feedback. Google Customer Reviews requires that you display the survey opt-in to all your users after checkout. To enable, merchants must place a specific code that triggers the survey on their completed transaction page. Customer Reviews are also available on mobile sites, with the same opt-in option. As a side note, it’s important to differentiate Customer Reviews from Google Reviews. While users have been able to leave reviews on Google business listings (Google Reviews), the new process is designed to verify that reviews have been left by customers who have actually made a purchase from that store. As such, Customer Reviews are only available to businesses with an online store. While the differences are significant, it’s important to keep in mind that many features including the Seller Ratings on Google and badge display will remain the same. What About That Trusted Store Badge? Even though Google recently changed up their Trusted Stores program, stores can still display that coveted badge. The difference is, now you can add that badge to any page on your website, ensuring that customers will see reviews when it matters most. 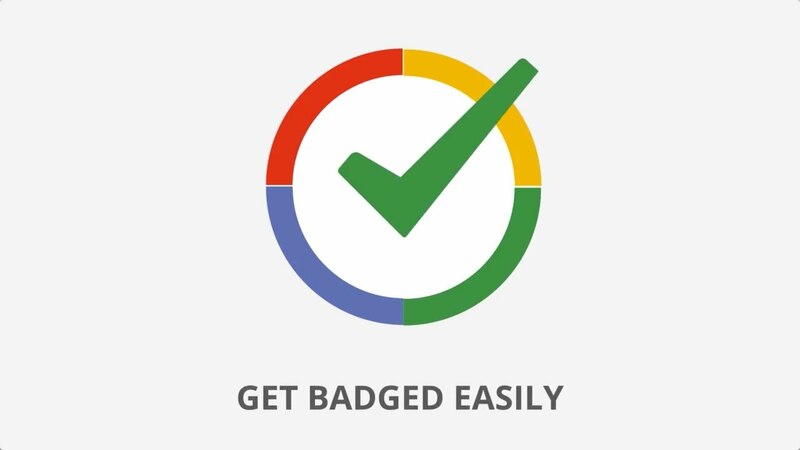 The badge is an image you can add to your website used to promote your participation in the Google Customer Reviews program. If you violate Google’s Customer review policies, they might suspend your account and your badge will disappear. That penalty isn’t necessarily permanent, though. If you make the required changes, Google will review your account and your badge will reappear. Google Customers Review Badge: A badge on your site that helps users easily identify your site with the Google brand. The badge displays the seller rating score of 1-5 stars can be placed on any page of your site. Google Customers Reviews Survey: The survey is an optional, brief questionnaire that enables customers to rate their purchase experience with your site. Seller Ratings: An aggregate score that appears on search ads and Google Shopping, as well as on Google Customer Review badges. A new, significant factor of Customer Reviews is its impact on Seller Ratings. Seller Ratings are an automated extension that highlight which sellers have high ratings. They are designed to reflect customers’ overall experience with your brand. They appear below text ads and help customers find reliable brands while potentially increasing those brands’ ad performance. Generally, they only show when a brand has 150 unique reviews and an average rating of 3.5 or higher. Seller ratings are marked on a scale of 1-5 with green stars (not the yellow stars, which refer to the product rating). Ratings come from seller rating websites and other third-party sources. Now, the new Customer Reviews also contribute to the seller ratings. First, the great news: Those that have an existing Google Trusted Store will be automatically will be migrated to Merchant Center. For those that don’t, it’s a simple signup process. And as mentioned before, it’s one of the biggest advantages of the new program. If your site meets all of the requirements, you’re free to set up Customer Reviews. To get started, you’ll need a Google Merchant Account (accessed and set up through your Google account). Once you’ve successfully agreed and signed up, the Customer Reviews should appear as a program in your Merchant Center. That’s it. No bells and whistles or a long list of requirements. Complete the above steps, and you’re in. As of now, Google Customer Reviews is available in 23 countries, including the United States, Germany, The United Kingdom, Canada, and China. Another advantage of the Review system is its insight into seller analytics. Accessed through Merchant Center, your Customer Reviews dashboard contains information collected by Google. Tracking these metrics will give you a better understanding of how your customers are responding to your products and process. For example, if you notice a significantly bigger amount of opt-ins than responses received, it may mean that your customers were happy with their shopping experience, but not the delivery speed or product received. So, Why Do I Need Google Customer Reviews? The overall benefits of Customer Reviews are similar to what Google Trusted Stores provided. Mainly, increased exposure and customer trust. Much like the Trusted Store badge, the Customer Review icon signals to customers that your business has earned the Google seal of approval. Again, the badge is optional, and you’re free to choose if or where you’d like to display it on your page. For example, if you don’t have enough reviews to earn a Seller Rating, you can choose to wait to display the badge until you do. When customers click on the badge, they’ll be taken to a page that breaks down your rating and shows customer reviews. The ease of the simple survey (only one question) will also likely result in more submitted. Do keep in mind that the text that appears in the opt-in and the survey is currently not customizable, though Google has noted that it may be an option in the future. Perhaps most importantly, the collection of reviews is becoming increasingly important in today’s e-commerce world. Unfortunately, collecting (good) reviews can be a chore. But it doesn’t have to be. Google streamlines the process and makes it easily available to customers with its new review system. Of course, with the good comes some bad. Most notably, the ability for negative reviews to be collected and displayed. While some negatives are inevitable, remember that the best way to combat an unfavorable review is a quick reply that apologizes and acknowledges the customer’s complaint. How Do You Get Better Google Reviews? We’ve talked about the benefit of positive customer reviews, but some businesses might not know how to get customers to share their opinion. According to HubSpot research, most customers are usually happy to provide feedback when asked. You’ll just need to make sure you’re asking for that favor the right way and at the right time. Sales and marketing are changing. Today’s online landscape is highly competitive and brands who don’t offer a convenient, personalized experience risk losing sales to a competitor. We’ve long understood the value of customer retention. The Harvard Business Review estimates that customer acquisition can be up to 25X more expensive than retaining an old one. Getting customers to stay, however, requires shifting your focus from building awareness to building loyalty. This article covers several ways to improve brand loyalty if you’re not sure where to begin. If you have a positive rating, show it off. Google Customer Reviews Badges are optional, but they work to establish trust with new customers. If your rating could be better, you might not want to display the badge. In this case, it’s time to review your data and revamp your customer service strategy. If customers have to jump through hoops to record feedback, you’re only going to get reviews from brand loyalists and “very disappointed” customers. For that less extreme majority, leaving a review depends on whether it’s convenient. Head over to Google Support to create a link for customers to write reviews. You can share this link with customers, add it to social media, promote it on your website, or include it in your email signature. The point isn’t to pressure customers into leaving their feedback. Instead, it’s about visibility at every possible touchpoint. Make sure you’re soliciting feedback at the right time in the customer journey. If your timing is off, it could lead to a customer leaving a negative review that people will read down the line. Google Customer Reviews’ opt-in process collects customers’ permission to receive the survey. They’ve agreed to the email upfront. The platform will also take care of the timing, so you don’t need to worry about scheduling emails based on open-rate stats. When a customer sees that a business owner responds to their customers, they will be more likely to share their feedback, too. Responding to positive reviews shows that you value your customers and appreciate that they took the time to complete the survey. Being responsive also extends to complaints and criticisms. According to the Harvard Business Review, businesses that responded to negative reviews received a higher rating than those that ignored them. If you receive a one or two-star review, take the time to offer a thoughtful response and present a solution. That said, if you say you’ll make a change, you need to follow through. Address any complaints right away and aim to move the conversation to an email or a phone call. This way, prospective customers will see that you care about customer concerns, but they won’t get a front row seat to an angry public conversation. There’s nothing like social proof to attract more customers. BrightLocal research found that 86% of people read reviews for local businesses and 57% of those respondents said they only use businesses with four or more stars. Positive reviews function as a signal that there’s some value in your product or service. Not only does that “signal” go out to potential customers, but Google also relies on reviews as part of its ranking algorithm. In fact, Moz estimates that reviews account for 15% of local rank factors. Our point is, positive reviews play a vital role in both customer sentiment and SEO. Consider sharing testimonials or reviews on social media or creating a page on your site where customers can read reviews. Fake reviews, whether paid or made up by employees aren’t illegal, but they do violate Google’s terms and conditions. Google created Trusted Stores back in 2011 as a way to protect customers from dishonest online brands. Since then, measuring trust is more about hearing what the customer has to say. In short, paying for reviews is a bad idea. While many sites recommend incentivizing reviews, it’s better to focus on delivering value to customers and making it easy to share feedback. One of the biggest barriers to entry with Google Trusted Stores was the oftentimes lengthy sign-up and review process. With the new Customer Reviews, Google has eliminated that barrier. And with so little standing in your way, there’s little reason not to get started with Customer Reviews. 1. Why Do I Need Google Customer Reviews? 2. Are Google Customer Reviews Mobile Friendly? Yes. Google Customer Reviews are available for both desktop and mobile devices. While you will need to add the opt-in code snippet on your mobile site’s confirmation page, the service displays across all devices without integration. 3. Am I Eligible To Participate In Google Customer Reviews? In order to be able to participate in Google Customer Reviews, your website must include an order confirmation page and you must adhere to Google’s product policies. Be transparent with all company and product information. List and risks, or relevant disclaimers, associated with your product. 4. Google Customer Reviews Survey Has Only One Question. Can I Customize The Survey To Fit My Needs? Unfortunately, no. At this time Google Customer Reviews are not customizable. All text that appears in the survey, cannot be removed or edited. However, Google is always improving their products and programs so there may be a time in the future that customization is possible. If customization is a feature that you feel would be of benefit to your business, I suggest getting in touch with Google Customer Reviews support to let them know. 5. Do I Have To Display The Google Customer Reviews Opt-In Prominently On My Page? The simple answer is no. You can display the Google Customer Reviews opt-in a less prominent spot on your page but that could lead to lower opt-in rates. Google recommends placing the opt-in at the center of the page for best results. How to include google seller rating in our own site?